This entry was posted in 1981, Album Reviews, King Crimson, Post-Punk, Prog, Rock and tagged adrianbelew, billbruford, brianeno, egrecords, kingcrimson, philipglass, rhettdavies, robertfripp, stevereich, talkingheads, tonylevin. Bookmark the permalink. From Bill Bruford’s recommendation in his fascinating memoir, I purchased the live ‘Absent Lovers’ 2CD set, recorded at the end of the tour that marked the demise of this incarnation of KC. It is a brilliant and sometimes confronting set that compliments ‘Discipline’ very well indeed. While we are on the subject of compliments, thanks for a fine review of one of my favourite albums, Matt. 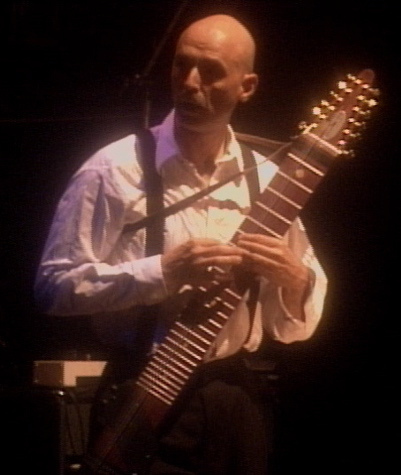 I also enjoy that I sometimes learn something new in your pieces, on this occasion that Tony Levin was offered the bass role in Weather Report. Cheers for that, Bruce, appreciate it. Am very much with you on Absent Lovers, it’s really outstanding. Am I right in saying that it was their last ever gig? I’ve just acquired this album – great stuff. Thanks Ovidiu and very pleased you are checking this out. Hope it inspires you to check out their other two great albums of the ’80s too, ‘Beat’ and ‘Three Of A Perfect Pair’. My favourite Crimson album and my favourite Crim era too. And a vote for Absent Lovers from me as well. You picked great vids here too, that version of Elephant Talk is outstanding… the band knows it too judging by all the grins at the end. I’m with you on all that… Thanks for dropping in. Great stuff. Sounds like we went in reverse directions! I started at ‘Discpline’ and then went back. But, fast-forwarding to now, the new Crim unit looks and sounds pretty impressive, as you say. I love that era of crimson. “Frame by frame” and “3 of a perfect pair” are my favourites.